I wish I were a skilled baker. I most especially wish I were a skilled cake baker. Now don't get me wrong, I have constructed some decent cakes in the past. When my two oldest were younger I went all out making their cakes. However, they were not especially spectacularly baked. I could construct and decorate a cake decently, but the cake baking itself was just eh, so-so. Fast forward several cakes, a few parties, and realizing that we always had left over cake, and I eventually just stuck with making cupcakes for birthday parties. Occasionally though, I still want to make a small birthday cake. 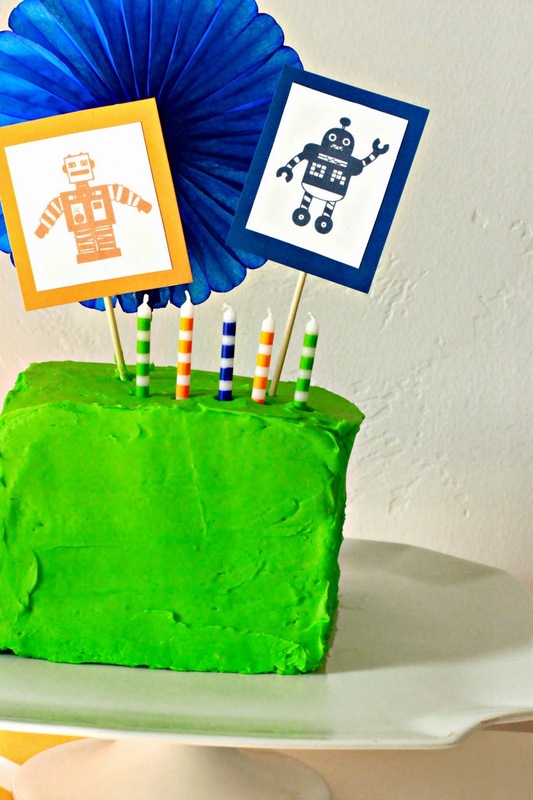 Like for Little's Robot Birthday Party, for example. 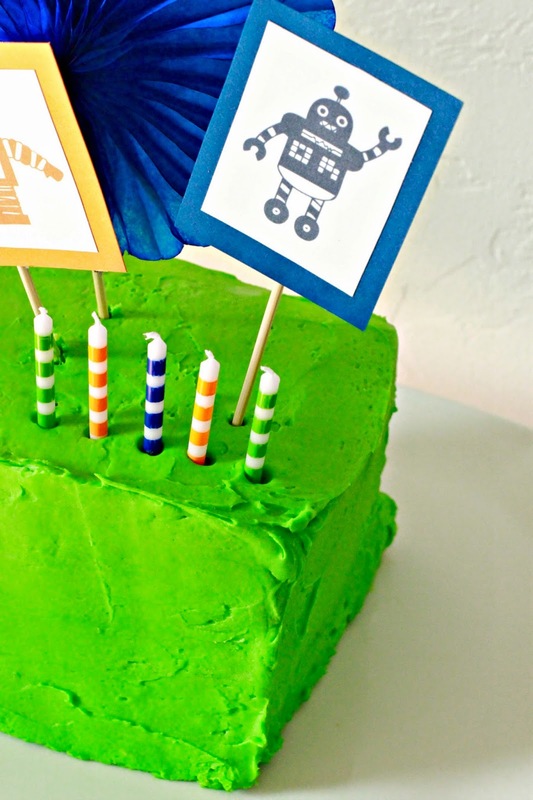 I shared the Robot Birthday Party details yesterday. This party came together in under a week. Basically, I was WAY behind, and I wanted the making of the cake to not take up too much time. So I scratched off making a birthday cake from scratch off my list...hehehe. However, cake mixes from a box don't offer the density and structure that a good from scratch cake does. Did you know that you can use a cake mix as your base and with just a few extra ingredients you can make it more like a homemade cake? I have actually tried a few recipes that claim to achieve this "from scratch" cake mix. I have been disappointed many times, not really getting the results I wanted. 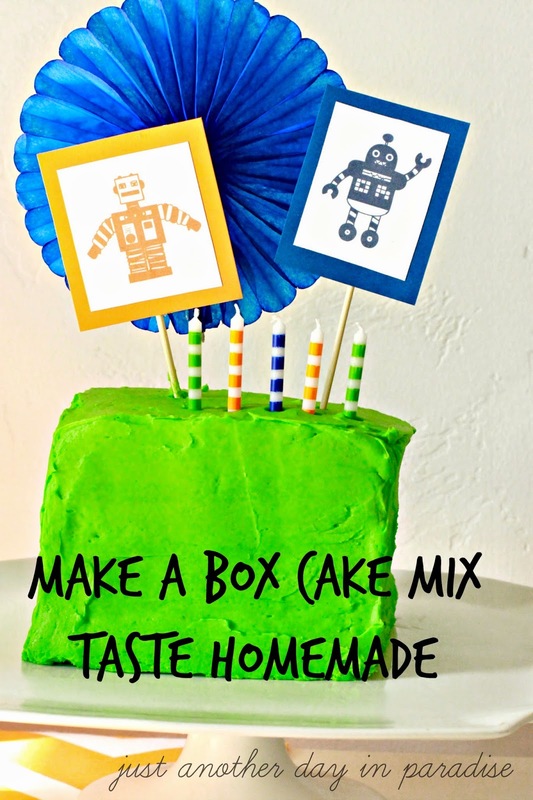 I finally found the perfect recipe to create this Make a Cake Mix Taste Homemade. Perfect, I tell you. Don't judge the recipe by my less-than-perfect decorating. The cake was great, and it all started with a regular old store bought cake mix. Preheat oven to 300 degrees. Whisk the dry ingredients together in a bowl. In the bowl of a mixer, combine the wet ingredients. Add in half of the dry ingredients and mix until smooth. Then add in the rest of the dry ingredients and mix the batter for two minutes. Pour the batter halfway up a prepared pan (or 2/3 full cupcake tins). Bake at 300 degrees for 20-30 minutes depending on the size of the pan. Then, while keeping the oven door closed turn up the heat to 325 and cook for the same time. Cake is done when a toothpick comes out clean. Now go on out and make yourself a not-so-from-scratch from scratch cake.